Steve Yarbrough "The Realm of Last Chances"
In a captivating departure from the Deep South setting of his previous fiction, Steve Yarbrough now gives us a richly nuanced portrait of a marriage being reinvented in a small town in the Northeast, in his most surprising and compelling novel yet. About the author: Born in Indianola, Mississippi, Steve Yarbrough is the author of five previous novels and three collections of stories. A PEN/Faulkner finalist, he has received the Mississippi Authors Award, the California Book Award, the Richard Wright Award, and another prize from the Mississippi Institute of Arts and Letters. He teaches at Emerson College and lives with his wife in Stoneham, Massachusetts. One of the highlights of our year, Booktopia 2013: A Celebration of Authors! The Northshire is thrilled to announce our friends at Books on the Nightstand are returning for Booktopia 2013! Whether you like fiction, non-fiction, mystery, history, or memoir, you are in for a treat at Booktopia VT! Each of the following authors will speak for 10 - 15 minutes, a book signing will follow. This event is free and open to the public, no registration required. Nichole Bernier, THE UNFINISHED WORK OF ELIZABETH D.; Amy Brill, THE MOVEMENT OF STARS ; Jon Clinch, Kings of the earth and The Thief of Auschwitz; Sara J. Henry, Learning to Swim and A cold and lonely place; Elizabeth Kelly, APOLOGIZE, APOLOGIZE and the forthcoming The Last Summer of the Camperdowns ; Paula McLain, THE PARIS WIFE; Chris Pavone, The expats; Will Schwalbe, THE End of Your Life Book Club; Steve Yarbrough, SAFE FROM THE NEIGHBORS and the forthcoming The Realm of Last Chances ABOUT THE AUTHORS: Nichole Bernier is author of the novel THE UNFINISHED WORK OF ELIZABETH D, and has written for magazines including Elle, Self, Health, and Men's Journal. A 14-year contributing editor for Conde Nast Traveler, she was previously on staff as the magazine's golf and ski editor, columnist, and television spokesperson. She received her master's degree from the Columbia Graduate School of Journalism, and is one of the founders of the literary blog Beyond the Margins. Nichole lives outside Boston with her husband and five children. Amy Brill is a writer and producer. Her articles, essays, and short stories have appeared in numerous publications including Salon, Guernica, and Time Out New York, and have been anthologized in Before and After: Stories from New York and Lost and Found. A Pushcart Prize nominee, she has been awarded fellowships in fiction by the Edward Albee Foundation, Jentel, the Millay Colony, Fundacion Valparaiso, and the Constance Saltonstall Foundation. In 2005, she was the Robert and Charlotte Baron Visiting Artist Fellow at the American Antiquarian Society in Worcester, MA. Jon Clinch has been an English teacher, a metalworker, a folksinger, an illustrator, a typeface designer, a housepainter, a copywriter, and an advertising executive. Clinch's first novel, Finn—the secret history of Huckleberry Finn’s father—was named an American Library Association Notable Book and was chosen as one of the year's best books by the Washington Post, the Chicago Tribune, and the Christian Science Monitor. It won the Philadelphia Athenaeum Literary Award and was shortlisted for the Sargent First Novel Prize. His second novel, Kings of the earth—a powerful tale of life, death, and family in rural America, based on a true story—was named a best book of the year by the Washington Post and led the 2010 Summer Reading List at O, The Oprah Magazine. A native of upstate New York, Jon lives with his wife in the Green Mountains of Vermont. They have one daughter. Sara J. Henry has worked as a magazine editor, correspondence writing school instructor, newspaper sports editor, website designer, e-commerce webmaster, soil scientist, bicycle mechanic, and health and fitness writer. She has edited many nonfiction books, and has a master in journalism from Carleton University, Ottawa. She is a Tennessee native living in southern Vermont with at least one too many dogs. Elizabeth Kelly is the best-selling author of the novel Apologize, Apologize! and is an award-winning journalist. She lives in Merrickville, Ontario, with her husband, five dogs, and three cats. Paula McLain has published two collections of poetry, “Less of Her” and “Stumble, Gorgeous,” both from New Issues Poetry Press, and a memoir entitled “Like Family: Growing Up in Other People's Houses” (Little, Brown, 2003). “A Ticket to Ride,” is her debut novel from Ecco/HarperCollins. She received her MFA in poetry from the University of Michigan in 1996, and has since been a writer-in-residence at Yaddo, The MacDowell Colony, and The Ucross Foundation Residency Program, and received fellowships from the National Endowment for the Arts and the Ohio Arts Council. Individual poems and essays have appeared in numerous journals, including the Gettysburg Review, Antioch Review, and The New York Times Sunday Magazine. As well as teaching part-time at John Carroll University, she is a core faculty member in the low-residency MFA Program in Poetry at New England College Chris Pavone grew up in New York City, and attended Midwood High School in Brooklyn and Cornell University. He worked at a number of publishing houses over nearly two decades, most notably as an editor at Clarkson Potter, where he specialized in cookbooks; in the late nineties, he also wrote a little (and mostly blank) book called The Wine Log. 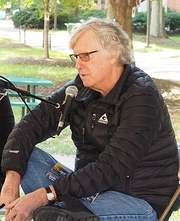 His first novel, The expats, released in the U.S. and the U.K. in early 2012, was an instant New York Times bestseller, and is being published in fifteen languages on five continents, and developed for film. Chris is married and the father of twin schoolboys, as well as an old cocker spaniel, and they all live in Greenwich Village and the North Fork of Long Island. Will Schwalbe has worked in publishing (most recently as senior vice president and editor in chief of Hyperion Books); digital media, as the founder and CEO of Cookstr.com; and as a journalist, writing for various publications including The New York Times and the South China Morning Post. He is on the boards of Yale University Press and the Kingsborough Community College Foundation. He is the coauthor, with David Shipley, of Send: Why People Email So Badly and How to Do It Better. Steve Yarbrough received his B.A. and M.A. in English from the University of Mississippi and his M.F.A. in Creative Writing from the University of Arkansas. Writing largely within the Southern tradition, he draws his themes and characters from Southern history and mores in ways that have been compared to Flannery O'Connor, William Faulkner, and Willie Morris. Steve Yarbrough lives with his wife, the Polish literary translator Ewa Hryniewicz-Yarbrough, and two daughters (Tosha, Lena) in Fresno, California. Steve Yarbrough is currently considered a "single author." If one or more works are by a distinct, homonymous authors, go ahead and split the author. Steve Yarbrough is composed of 3 names. You can examine and separate out names.